We bring you the most alluring window covering in a hand made cluny lace runner, as seen in the popular TV series Reign II. 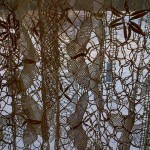 This delicate whisper of lace is superb in Vintage Ecru colour, with butterflies perching as if ready to take flight. How amazing when art can be captured in everyday life. Experience the metamorphosis of a beautiful home with this curtain panel! 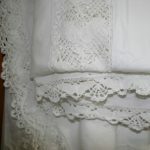 The loose texture of this Cluny lace gives a pulled appearance to the outline, as if the brides were slightly straining it, and the pin-holes, from the same looseness, appear less precise in form and as free as the butterflies. Close up version exhibiting details. 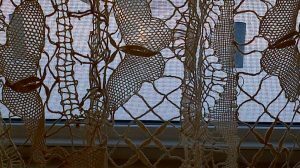 Cluny lace is a bobbin lace style, worked as a continuous piece. 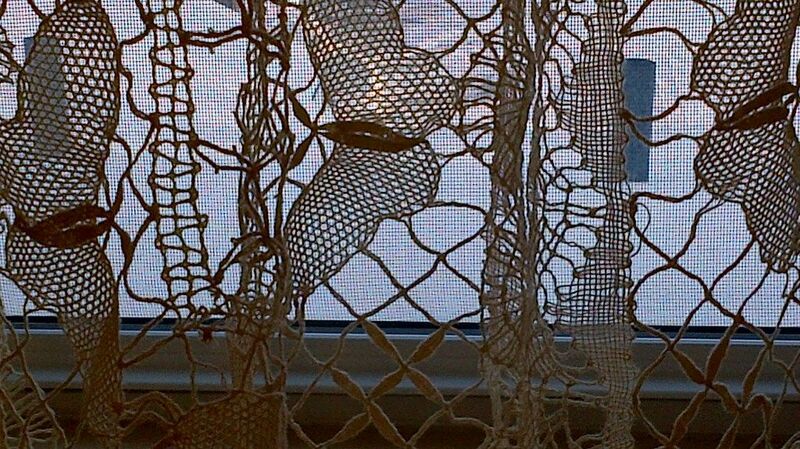 It is a heavy plaited lace of geometric design, often with radiating thin, pointed wheatears (closely woven leaves). Originating in France, it appeared in the nineteenth century in Le Puy and Mirecourt in Lorraine. 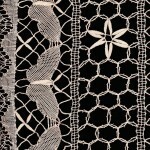 Cluny Lace has a heavy net background in which the stitch is darned. 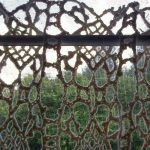 It derives its name from the Museum of Antiquities in the Hotel Cluny, Paris, because this lace originally had a rather medieval appearance. Its patterns were usually of quaint or antique ,1 design, woven to preserve old traditions; birds, animals and flowers predominating. 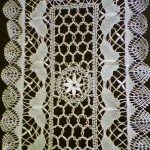 Cluny is now usually made in cotton and somewhat resembles the Maltese Lace. Made of pure cotton thread. 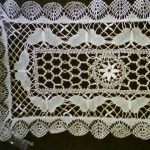 Cluny Lace or Bobbin Lace distinctive hand made features. Lengths : 36″, 54″, 62″.